Like branches on a tree, our lives may grow in different directions, yet our roots remain as one. Mary Josephine Bradin was born April 13, 1916, near Merwin, MO, to Joseph Bradin and Ethel (Rogers) Bradin. 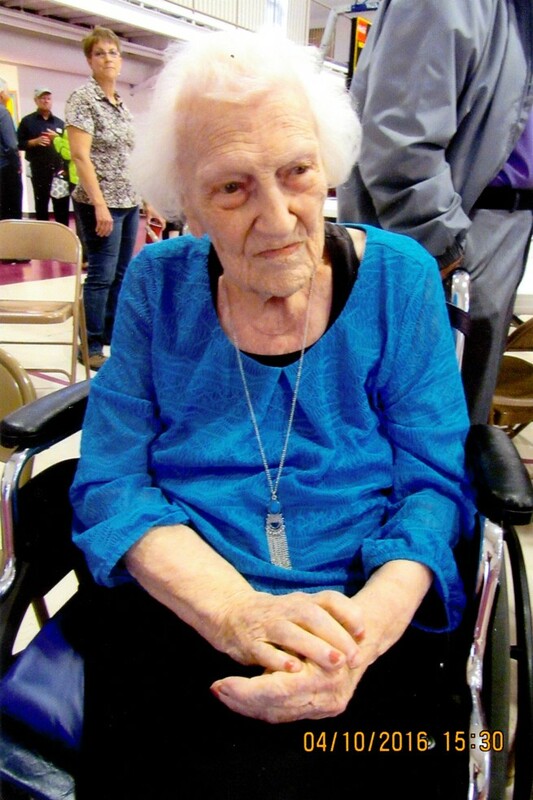 She departed this life on May 6, 2016, at Community Springs Nursing Home at the age of 100. At the time of her death she was a member of First Baptist Church in El Dorado Springs. Josephine graduated from Merwin High School in 1934. She went to Warrensburg Teacher College for a year, then she began her teaching career at a country school near Peculiar, MO. While there she met Walter LaVere Steward, and they were married in Kansas City on October 16, 1936. They later moved to the Steward family farm near Montevallo, MO. Josephine continued teaching at Barnes School, a country school with only one room. She then taught at Montevallo School for several years, until it was closed down, and she taught grade school in El Dorado Springs. While teaching she continued her education at Southwest Baptist College and Warrensburg State College, where she graduated with a Bachelor’s Degree in Education in 1957. LaVere passed away on December 31, 1956. Josephine supported her family by teaching and running the family farm. In 1961, Josephine moved to Corvallis, OR, to be near her daughter and continue her teaching career. While there she continued her education at Oregon State University, earning her Master’s Degree in Education. She married Loren Johnson in June 1967. They lived in Corvallis until her retirement from teaching in 1979. They moved back to Stockton, MO, to enjoy retirement. Josephine was very active in many community activities, including ADK, Retired Teachers, Calico Clippers Quilt Club, Moss House, Missouri Extension Council, and many other activities. She was also active in the Stockton Christian Church. Loren passed away in August 1993. Josephine continued to live in Stockton until the tornado of 2003, after which she moved to El Dorado Springs, where she resided until her death. Preceding Josephine in death were both husbands; her parents; sisters, Cecil Bauer and Edith Melchart; brothers, Homer Bradin and John Bradin, daughters-in-law, Sandra Steward and Loretta Steward; son-in-law, Robert Marcum; grandson, Devin Steward; granddaughter, Darla Steward; and great-grandson, Brian Brown. Survivors include: son Walter J. Steward and wife, Ann, and their family: Darin, Dana, and David; son Leon Ray Steward and wife, Debee, and their family: Mike, Brad, Scott, and Leigh Ann; daughter Geraldine Kay Marcum and her family: Cindy, Connie, Cheryl, and Michael; step-son Harold Steward, whom she raised as her own, and his family: Carlene, Richard, and Brian; fourteen grandchildren; twenty-eight great-grandchildren; and three great-great-grandchildren; special niece, Frances Mckenzie; and many other nieces, nephews, and friends. Josephine was a beloved daughter, wife, mother, grandmother, great-grandmother, great-great-grandmother, teacher, and friend. Funeral services for Josephine Johnson were held Monday, May 9, 2016, at the First Baptist Church of El Dorado Springs with Rev. Ron Marsh officiating. Music was provided by Rusty Carver and Rebecca Keltner. Interment followed at the El Dorado City Cemetery under the direction of Bland-Hackleman Funeral Home. Pallbearers were: Michael Steward, Darin Steward, Brad Steward, David Steward, Scott Steward, and Brian Steward.